Sold a Single Family home in 2018 in South Lyon, MI. Sold two homes in 2017-2018 in South Lyon, MI. I recently went through the home buying process with Tracy, I have nothing but great things to say about her. Not only was she very professional and pleasant to work with, her knowledge and expertise relating to real estate is unmatched and very impressive. She was very responsive and detail oriented, and she ensured I was comfortable with everything - I sensed absolutely no "pushyness" at all. Bought a Single Family home in 2018 in South Lyon, MI. South Lyon is ideal for those looking for a small town atmosphere with big city conveniences, as it’s located within easy access of Interstate 96 and US 23. Moreover, residents enjoy a lively downtown featuring annual festivals, hundreds of acres of parkland, and highly rated schools. Patti Mullen has been a successful Realtor for the last 25 years and is consistently Remerica Hometown One’s top producing agent. Patti’s team consists of four full-time Realtors. Their service areas of expertise include South Lyon, Northville, Novi, Plymouth and other surrounding cities. This experience and local knowledge of the community helps us quickly find the ideal home for our clients. 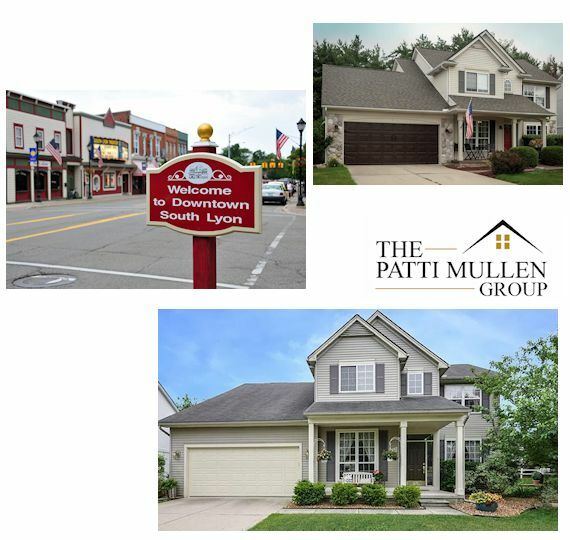 If you’re looking to buy a home in South Lyon, MI, start your search with The Patti Mullen Group today! If you’re looking to sell a home in South Lyon, our experts can streamline this process. Our ability to maximize client results on home sales is one main reason we’ve earned a reputation as top Realtors in the area. The Patti Mullen Group understands the local community and has a track record of success. Downtown South Lyon entertainment – Downtown South Lyon features twelve walkable blocks of shops and dining options, totaling over 100 stores, restaurants and services. Downtown comes alive with year-round events including the South Lyon Farmers Market, Pumpkinfest, Cool Yule, Heritage Festival, Concerts in the Park, Blues, Brews, and Brats, Lake Street Cruise-In, and more! Acres of Parkland – South Lyon residents enjoy over 200 acres of Parkland, including the 15 acre McHattie Park, the 130 acre Volunteer Park, Paul Baker Memorial Park/Fountain Park, Andover Park, Columbia Park, and the Huron Valley Rail Trail. South Lyon also provides close access to numerous regional recreation options, including Kensington Metropark, Island Lake Recreation Park, and Maybury State Park. Location and History – Located in the southwest corner of Oakland County, the city of South Lyon was originally called Thompson’s Corner, an agricultural center that was incorporated as a city in 1873. While only 3.5 square miles in the size, South Lyon is now growing into a manufacturing hub, containing 70 acres of light industrial properties. South Lyon is ideal for those looking for small town living with big city conveniences, as it’s located within easy access of Interstate 96 and US 23. With over 25 years of successful real estate experience and extensive knowledge of the local community, our Realtors can maximize results on either end of a home transaction. Therefore, whether you need help buying or selling a home in the area, talk to our South Lyon Realtors today. South Lyon Community School District’s rating is in the top 8% of the state and features an early childhood center, seven elementary schools, two middle schools, and two high schools. All schools use the South Lyon Schools core curriculum as a guide. Special programming, including the Magnet and Plus Programs are also available.